Austrian born visionary painter and spiritual ecologist Friedensreich Hundertwasser (Friedrich Stowasser; born 1928) consistently worked with spiral motifs, primitive forms, spectral colors, and repetitive patterns. Although influenced by other Viennese artists, Hundertwasser was never formally affiliated with any "ism." Friedensreich Hundertwasser was born Friedrich Stowasser in Vienna on December 15, 1928, of a Jewish mother and a Christian father. His father died in 1929. Hundertwasser was baptized in 1937 and supposedly joined the Hitler Youth Corps in 1941. In 1943 69 of his maternal relatives were deported and killed in Nazi concentration camps. During the war and the Russian occupation Hundertwasser lived in a Viennese cellar with his mother. Decades after the Hitler period he could be seen carrying asatchel containing a passport, foreign currencies, and a portable painting set, among other essentials. Hundertwasser married in 1958, while in Gibraltar, and was subsequently divorced in 1960. In 1962, after spending a year in Japan, he married Juuko Ikewada in Venice. They were divorced four years later. 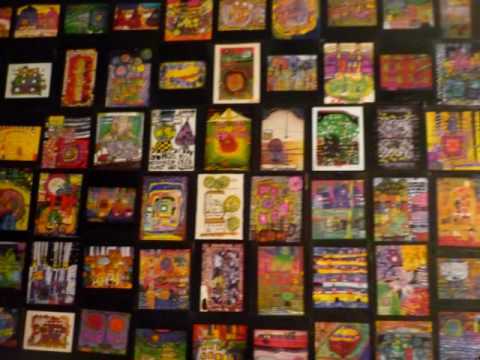 Hundertwasser is viewed as an international, independent artist. He traveled, lived, and worked in various locations throughout Europe, the East, North Africa, New Zealand, and Australia and was never formally affiliated with any school of painting or "ism." In 1949 he selected and assumed the name Hundertwasser (Hundred Water), and in 1969 Friedensreich (Kingdom of Peace), often adding Regenstag (Rainy Day), a name that he originally invented for the converted sailing ship upon which he sometimes lived. From 1936 to 1937 Hundertwasser attended Montessori School in Vienna, a learning experience to which he would later credit the choice of color in his paintings. His formal art training included three months at the Academy of Fine Arts in Vienna in 1948 and a day at the Ecole des Beaux-Arts in Paris in 1950. As a mature artist he professed an intense dislike for all art theory, including color theory. Hundertwasser believed that painting is a religious experience. Opting always for spiritualism over rationalism, he preferred to be viewed as a "magician of vegetation." In 1954 the artist developed a quasi-mystical philosophy of artistic creation and perception called "Transautomatism" which he later developed into a "Grammar of Vision." Hundertwasser's early paintings were heavily influenced by the Vienna Secession tradition of Egon Schiele and Gustav Klimt. His works from 1949 through 1953 also display close affinity with well-known paintings by Paul Klee. In 1953 the spiral motif first appeared in his work and became the most consistent formal element of his mature style. The artist, who first recognized the spiral while viewing a film called "Imagery of the Insane," defined the motif as a "biological spiral" and "a symbol of life." Throughout hiscareer Hundertwasser used the six spectral colors almost exclusively. His later work combined these with metallic colors such as gold, silver, bronze, or aluminum. His forms are archaic and primitive and his picture surfaces are often covered byrepetitive patterns. It was the artist's intention to offer his viewers aglimpse of Paradise, constructed while the creator is in a dream state. The work is rarely disturbing and almost always highly decorative. Hundertwasser made no attempt to identify universals with his primitivized forms, and as a result his language remains relatively private. The audience is given only limited access to the painter's fantasy experiences. Hundertwasser's dreams were more than a little repetitive, but usually pleasant. Numerous exhibitions of Hundertwasser's paintings have been mounted, including one-man shows at the Art Club, Vienna (1952); Studio Paul Facchetti, Paris (1954, 1960, 1965, and 1974); Tokyo Gallery (1961); Austrian Pavilion, Binnale, Venice (1962); Kestner-Gesellschaft, Hannover (1966); University of California, Berkeley (1968); Auckland City Art Gallery, New Zealand (1973); and a retrospective at the Haus der Kunst, Munich (1975). In 1957 Hundertwasser was awarded the Prix du Syndicat d'Initiative, Première Bordeaux (France) Biennale, and in 1959 the Sanbra Prize at the Fifth São Paulo (Brazil) Biennale. That same year he assumed a guest lectureship in Hamburg at the Kunsthochschule der Freien und Hansestadt, only to be asked to leave his post because he performed the "endless line," a ten mile, two days and nights spiral. He was also awarded the Mainichi Prize at the Sixth International Art Exhibition, Tokyo, in 1961. The artist's public lectures and manifestations include: "Art Is Always Changing" (Salzburg, 1949); "My Aspiration: To Free Myself from the Universal Bluff of our Civilization" (Vienna, 1952); "Mouldiness Manifesto: Against Rationalism in Architecture" (Austria and Germany, 1958); "Les Ortilles" (Paris, 1959); "Naked Speech" (Munich, 1968); "Intensive Naked Demonstration" (Vienna, 1968); and "Your right to windows - your duty to the trees" (1972). A diverse artist, Hundertwasser also designed a church in 1987 and a day-care center in Frankfurt, Germany (1987). He created postage stamp designs for Austria, Senegal, and the Cape Verde Islands. He also designed relief medallions for the Austrian Mint, environmental posters donated to various environmental groups, and various architectural models. Hundertwasser received the Austrian State Awardfor Arts in 1980 and the Austrian Protection of Nature Award in 1981. He resided in Vienna.